The Supreme Grand Priory is the governing body of the United Grand Priories of the Hospitaller Order of Saint Lazarus. It meets on an annual basis and ensures the continuous growth of the Order and the operational logistics of its organisation. All its Grand Officers work within the Order on a voluntary basis and receive no remuneration. The Supreme Grand Priory is based in Edinburgh, Scotland and meetings of the Knights in Council are regularly held there. It is presided by its Supreme Grand Prior, H. E. Chevalier Richard Comyns of Ludston GCLJ GCMLJ. Its international operations are directed from the office of the Grand Chancellery, which is based in Malta, under the auspices of the Grand Chancellor, Chev. Massimo J Ellul GCLJ GCMLJ. Its administrative and legal operations are also based in Edinburgh, Scotland and administered by the Grand Secretary of the United Grand Priories, Chevalier Robin Slack KCLJ KMLJ. Supreme Grand Prior – H. E. Richard Comyns of Ludston GCLJ GCMLJ – Grand Priory of Scotland. Grand Chancellor – Chevalier Massimo J Ellul GCLJ GCMLJ– Grand Priory of Malta. Grand Secretary – Chevalier Robin Slack KCLJ KMLJ – Grand Priory of Scotland. Grand Chaplain – The Most Reverend Monsignor Anton Gauci ECLJ CMLJ – Grand Priory of Malta. Grand Marshal Emeritus – H. E. Jim Neilson GCLJ GCMLJ – Grand Priory of Scotland. 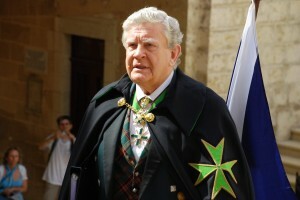 Grand Marshal – H. E. Steven Groenweld GCLJ GCMLJ – Grand Priory of South Africa. Grand Treasurer – Chevalier Thomas Nash KCLJ – Grand Priory of the International Lazarites. As per Supreme Grand Council directive, the operations of the various Grand Priories operating under the United Grand Priories remain independently led by their respective Grand Priors and Chancellors, without any influence by the Supreme Grand Priory save for instances wherein it would be reported to the Supreme Grand Priory that a specific Lazarite organization is not operating according to the letter and spirit of the constitutions of the United Grand Priories of the Hospitaller Order of Saint Lazarus of Jerusalem. The Supreme Grand Prior, H.E. Richard Comyns of Ludston GCLJ GCMLJ, officially opening the 2012 International Lazarite Symposium at the Knights’ of Malta ancient Sacra Infermeria. It was indeed the biggest Lazarite gathering worldwide in these last decades and further underlined the Order’s global Lazarite leadership in the field of Lazarite Hospitaller work. In April 2010, the elected Grand Officers of the Supreme Grand Priory were unanimously confirmed in their Grand Offices for the period April 2010 – April 2012. Furthermore, the Supreme Grand Priory admitted and officially sanctioned the representatives of the various new Grand Priories forming part of the United Grand Priories into its administrative organ. As per the Constitution of the United Grand Priories, which was ratified and amended in 2009, the Grand Priors and the Chancellors of all the authorized and recognized Grand Priories under the over lordship of the United Grand Priories are automatically elected to serve in the Supreme Grand Priory in order to represent the interests of the various jurisdictions under the Hospitaller Order of Saint Lazarus of Jerusalem. The Supreme Grand Prior, who is the chairman and chief executive officer of The Grand Council, shall hold office for a period of two years after The Grand Council votes for his election. There is no term limit for the position and the incumbent may offer himself for re-election at the end of his term. The Grand Prior is a lawyer by profession and heads a number of companies in the financial sector. The Grand Chancellor, who is appointed by the Supreme Grand Prior, on behalf of The Grand Council, and holds office during the pleasure of The Grand Council or until resignation, and shall in all things act for and on behalf of the Supreme Grand Prior if the latter is unable to perform the functions of his office by reason of absence or ill-health. The Grand Chancellor is a marketing and management consultant by profession and heads his own consultancy operations. The Grand Secretary, appointed by the Supreme Grand Prior, on behalf of The Grand Council, and shall hold office during the pleasure of The Grand Council or until resignation. It is the responsibility of the Grand Secretary to ensure the proper administration of this international organisation and deal with any possible disputes that may arise between Members of The Grand Council and members of the Order, or members of the public. The Grand Secretary is a Magistrate and Justice of the Peace for the Sheriffdom of Lothian and Borders, in South East Scotland. The Grand Marshal, appointed by the Supreme Grand Prior, on behalf of The Grand Council, shall hold office during the pleasure of The Grand Council or until resignation, and shall prescribe and regulate the arrangements for all ceremonies of the Order in accordance with the wishes of The Grand Council. The Grand Marshal is a retired Commander of the South African Navy and runs his own philanthropic non-governmental organisations in South Africa. The Grand Hospitaller, holds office during the pleasure of The Grand Council or until resignation, shall, when required, be responsible to The Grand Council for supervising the general direction, organisation and technical administration of the humanitarian projects undertaken by the constituent Grand Priories and their associated activities. In the exercise of his duties, the Grand Hospitaller may be assisted and advised by a Hospitaller Committee over which he shall preside and which shall comprise such members as may be appointed by The Grand Council after consultation with the Grand Hospitaller. Mons. Joseph Vella Gauci is an Officer of the Secretariat of COMECE (Commission of the Bishop’s Conferences of the European Community), based in Brussels and a Catholic Priest. The Grand Treasurer, is appointed by the Supreme Grand Prior, on behalf of The Grand Council, and shall hold office during the pleasure of The Grand Council or until resignation, shall preside over the financial affairs of The Grand Council and shall be responsible, to The Grand Council, for the receipt of Registration Fees, Fees of Honour and all matters relating to the procuring of income for the administration of The Grand Council. Thomas Nash is the Chairman and CEO of Xalles Limited, an international management consultancy firm. The Grand Chaplain General, who shall be appointed by the Supreme Grand Prior, on behalf of The Grand Council, shall be a Confrère of the Order of senior ecclesiastical rank, and shall hold office during the pleasure of The Grand Council or until resignation. The Grand Chaplain General shall be the advisor of The Grand Council in all matters of an ecclesiastical nature and shall determine the form of religious service and prayers to be used on such occasions as are not provided for by the Statutes or Regulations. Bishop Thomas Mount is the President of the World Miracle Network and is the spiritual shepherd to a College of Bishops, 1,567 Pastors and 152,000 church members in 5 nations.